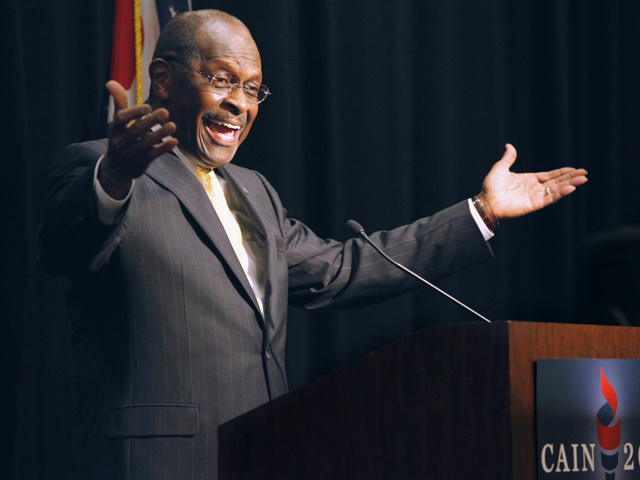 Herman Cain endorses "the people"
Failed presidential candidate Herman Cain sought to extend his fifteen minutes of fame Thursday, telling the Southern Republican Leadership Conference that he was endorsing "the people." The former pizza executive who dropped his bid for the White House in December after allegations of sexually inappropriate behavior toward a host of women has been telling supporters for weeks that he would make an "unconventional endorsement." Using the lofty rhetoric for which he is famous, Cain told the audience gathered in Charleston, South Carolina that he "stopped by here to tell y'all today we need another revolution! We need a solutions revolution!" "This time it won't be about bombs and bullets. We are not going to fight it with bombs and bullets. We are going to fight this solutions revolution with brains and ballots at the ballot box," Cain said. Since dropping out of the race for president, Cain said he has been consistently asked who he would back for president this year. "I have said consistently the unconventional candidate that ran an unconventional campaign and achieved surprising results," Cain said, building up to the big moment, adding that the media would not going to like his endorsement "but the American people are going to love it." "Here is my unconventional endorsement: Not a candidate seeking the nomination. Not someone that it is not running. My unconventional endorsement is the people! We the people of this nation are still in charge. That is who I am endorsing," Cain shouted. "We are the ones that are going to have to lead this revolution. We are the ones who are going to be able to take our power back. I am endorsing the people," he said. Cain has launched a bus tour to promote his controversial 9-9-9 tax plan and his website, the Cain's Solutions Revolution. Cain's signature 9-9-9 tax plan to eliminate the current tax code in favor of a nine percent income tax, a nine percent corporate tax and nine percent sales tax was ridiculed by many of his opponents as overly simplistic and regressive. Cain is set to appear Friday with comedian Stephen Colbert at a rally in South Carolina, The comedian, who is running for president as a joke, has urged his supporters in South Carolina to vote on January 21 for Cain, who remains on the ballot in the Palmetto state. Colbert was not able to get on the ballot.